Mildred L. Holy, age 88 of Sterling, died Thursday, July 6, 2017 at home surrounded by her family, after a brief and courageous battle with cancer. 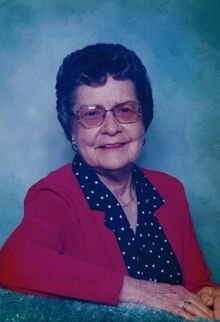 Mildred was born on December 20, 1928 in Sterling, the daughter of Gust and Darlene (Wetzell) Johnson. She grew up in rural Tampico and attended Tampico Grade School and the first two years of high school there. She then finished high school at Rock Falls, graduating in 1946. Mildred went on to attend beauty school in Sterling, graduating from there in 1947. She married Lyle E. Holy on October 30, 1949 in Sterling. He preceded her in death on May 18, 1995. Mildred owned and operated the Twin's Beauty Shop with her twin sister, Madolyn, from 1948 to 1952. She was a homemaker and enjoyed spending as much time as possible with Madolyn. Lyle and Mildred moved to Kissimmee, Florida in 1979 and returned back to Sterling in 1991. Survivors include her daughter, Sharon (Larry) Johnson of Sterling; her twin sister, Madolyn DeDecker of Annawan, IL; her brother, Arthur Johnson of Sterling; three grandsons, Wade Johnson of Sterling, Erik (Lisa) Johnson of Wheaton and Jeffrey (Laura) Johnson of South Beloit; five great-grandchildren, Alexa Johnson, Jacob Johnson, Ahnika Johnson, Sophia Johnson and Dylan Johnson and several nieces and nephews. She is preceded in death by her parents; husband; one son, Mark Holy and one brother, Kenneth Johnson. Visitation will be Wednesday, July 12, 2017 from 11:00 A.M. – 12:00 P.M. at the McDonald Funeral Home in Sterling, 505 1st Avenue. Funeral service will follow at 12:00 P.M. at the funeral home with Pastor Brad Wilson officiating. Burial will be at Oak Knoll Memorial Park in Sterling. In lieu of flowers, memorials may be made to Gaffey Hospice.